Edgar Martins from the series This is Not a House. Edgar Martins creates photographs which tend to find themselves immersed in political and social debates of the time. He is consistently engaged with the zeitgeist and his work reflects a critical analysis of our society and current affairs, whether it be our modern obsession with improvements or financial collapse. 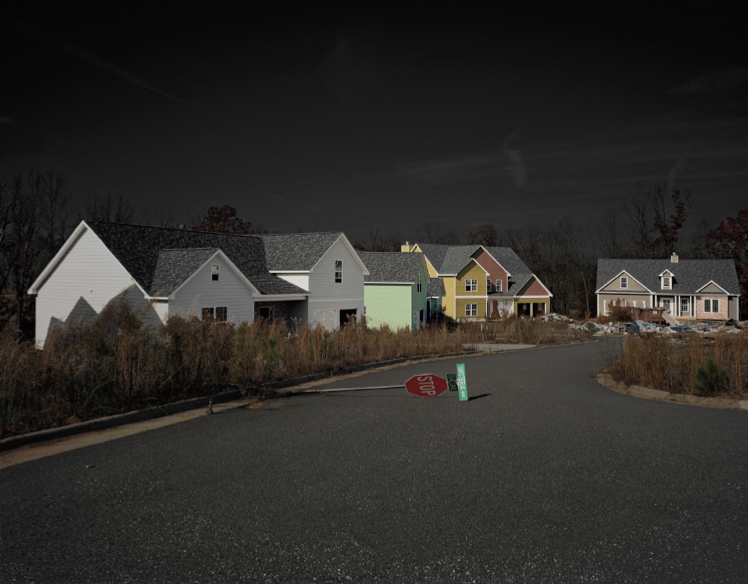 In 2008 Edgar’s work caused controversy in the US after he digitally re-shaped a select few images from his series This is Not a House, a commission for the New York Times Magazine, exploring the collapse of the housing market. Martins photographed abandoned golf courses, homes, hotels, ski resorts in 16 separate locations over 6 American States. 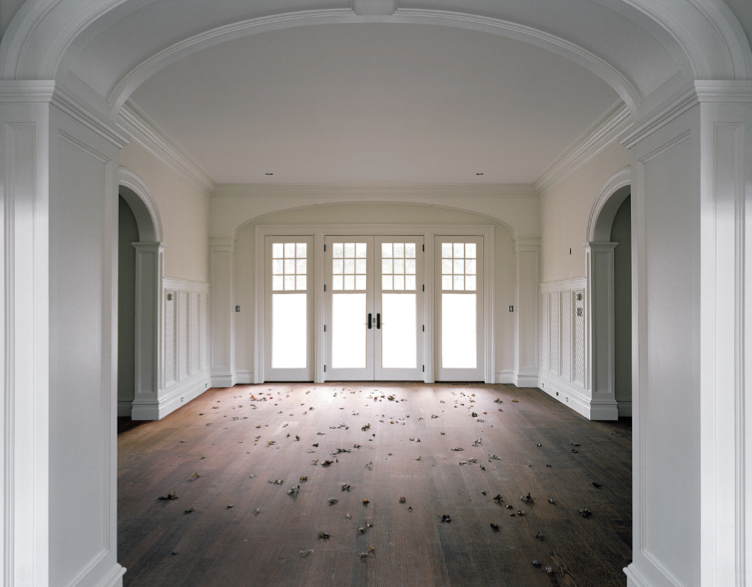 This is Not a House is currently touring Europe and the USA with stops scheduled this year at the Rome International Photography Festival (MACRO, September); The Gallery of Photography, Dublin (March-May 2013) & Ffotogallery, Wales (May-June 2013). What was a riveting polemic about deception and misrepresentation for some, was to others the re-surfacing of a tiresome age-old ontological, epistemological and moral chasm between Art and Journalism. In it’s scale and ambition This is Not a House reminds me of the important work conducted by the FSA in America during the Depression. Photographers such as Walker Evans, Dorothea Langue and Gordon Parks were commissioned to look at the living conditions of rural America in an era of financial disaster. The aim of images like Dorothea Langue’s Migrant Mother, was to introduce Americans to Americans. Seen in the national papers the images informed the nation about the effects of the Depression, particularly on the farming community and forced the public to ‘witness’ the extent of the poverty. These photographers were commissioned with a particular agenda and were asked to find specific images to fit a brief. We seemingly have no reason to wonder if they were accurate representations and not assumptions or bias because they were unaltered photographs. But photography itself is misleading. It does of course portray what it saw in front of the lens, but this does not make it a factual account of the general state of affairs. The lesson learnt is for the commissioning body to determine if they are asking a photographer to document an issue or asking an artist to interpret it. Here it seems they got both. Originally from Portugal, Edgar Martins moved to the UK in 1996 and soon completed an MA in Photography and Fine Art at the Royal College of Art. His work has been awarded numerous awards and received international recognition in being shown at MoMA, nominated for the Prix Pictet in 2009 and chosen to represent Macau at the 54th Venice Biennale. Born in 1977, Edgar already has 9 books to his name. He currently lives in London where he continues to consider the impact of modernity on society and uses photography to challenge our acceptance of what is real. SB: Your use of colour is striking. Are you conscious of colour techniques when you are choosing subjects and composition or is it an intuitive process for you? EM: In 2002, in the last year of my MA at the Royal College of Art, I helped to found a publishing house called The Moth House. I came up with this name, which I think is representative of the relationship I have with photography. I am of course drawn to light and color and in this sense much of this process is inherently intuitive to me. But I use light and color as means of enhancing the dialectical possibilities of the photographic image as something that fluctuates between the factual and fictional, between the real and the metaphorical. Although your images are aesthetically and visually beautiful you are very grounded in photographic theory and your concepts are dense and thought provoking. How did you develop this ‘best of both worlds’ approach? My visual approach to photography is more methodology than aesthetics. The frontal, rectilinear planes, straight perspectives and neutral viewpoint give the viewer a false sense of security. It helps to create the illusion of photographic transparency/objectivity. My images depend on photography’s inherit tendency to make each space believable, but there is a disturbing suggestion that all is not what it seems. This process of slow revelation and sense of temporal manipulation is crucial to the work. I use the ‘framework’ and the language of photography to talk about the process of thinking about and creating images. Photography, for me, is a medium built around conceptual tensions and so it offers me a means to bring together irresolvable contradictions. Your work has certain scientific aspects in its topographical approach and in isolating elements like artifacts. Yet you are questioning the certainty of such claims by showing them to be temporal and in flux. How important is it to you to question what is generally perceived to be ‘true’ and how does photography suit this? In my images I am forever denying the thing that I am representing, forever alluding to a world beyond this. The challenge lies in overriding photography’s inherent documentary function in order to connect the image to a world, narrative or pictorial culture beyond the referent. And that is where other disciplines and references come into play: whether it be painting, sculpture, physics, science, etc. And fiction, as Jacques Rancière argues, is elementary to understanding the real. Bernardo Soares (one of Fernando Pessoa’s many pseudonyms) wrote: “some truths cannot be told except as fiction”. Perhaps it may also be the case that some truths are better told as fiction. I like your description of the moral chasm between art and journalism and the point that perhaps some truths are better told as fiction. Do you see the art vs documentary divide as being defunct in today’s photography? Journalistic ethics aside, Art and Journalism have been using the same methods for artistic expression for many years, so I don’t think there is a chasm as such. What I have tried to highlight and question with projects such as This is not a House is how often social/politically-oriented issues are conceptualised and understood outside the scope of the canonical photo-documentary. Photojournalism has never felt the need to challenge or contravene certain rules, aesthetic or ethical. Yet, within this framework there is a perpetual search, not to mention a real need, to find new ways of assimilating and representing the real. So I viewed this project, from the outset, as a platform to explore new models for rethinking and tackling a particular subject-matter. As I recently mentioned in an interview to Aesthetica magazine I am of the belief that photojournalism’s prevailing framework promotes unattainable expectations and contributes to a culture of passive consumers who use and view images carelessly and gratuitously. This does a disservice to the public and Journalism itself. I am not saying that there isn’t good reportage out there. I am sure there is. Its just that the newspaper format, with all its pressures, deadlines, rigid operating culture and the constraints that normally arise from commercial/political associations is increasingly an inadequate vehicle for the dissemination of thought-provoking documentary photography. Photography is a medium that should help us to reflect on our place in the world as well as on the place of the photographic. What is your best advice for artists in difficult economic times? How would you advise artists to continue making work as well as paying the bills as it is becomes harder to rely on print sales? I harnessed the fund-raising skills from a young age. This is how I managed to publish my first book at the tender age of 18 and also how I put together my first exhibition. Prior to coming to England in 96, I decided to take a full year off my studies in order to work and save funds to study Photography. I thought this would keep me going for at least another year. Well, let’s just say the money didn’t go as far as I had imagined it would. So I was faced with a stark dilemma: how to continue studying, producing work and living? I used the fund-raising skills I developed when I lived in China, went to a local library and borrowed a book with the names and addresses of every single cultural organisation in Europe. I wrote the same letter to each organisation. I must have sent around 200 letters. Most didn’t reply, I got quite a few rejections, but one or two were very helpful. That is partly how I got myself through college and university. And since then bursaries & grants have been instrumental to my practice. So I think artists have to have their wits about them, have to be industrious, take initiative and not be phased by rejection. Most of the work I develop is still self-structured and ‘personal’. This often requires months of preparatory and research work, letters, proposals, fundraising, etc. This way of working is not for everyone, I get that, but all of this gets easier with time and a world of opportunities soon opens up. 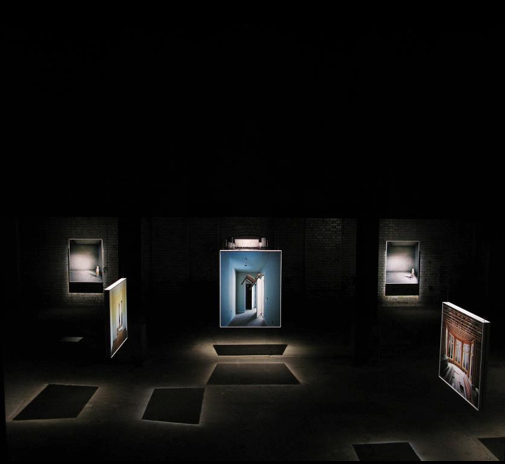 Installation view of This is Not a House at The Wapping Project by Edgar Martins. Find Edgar on Facebook here.